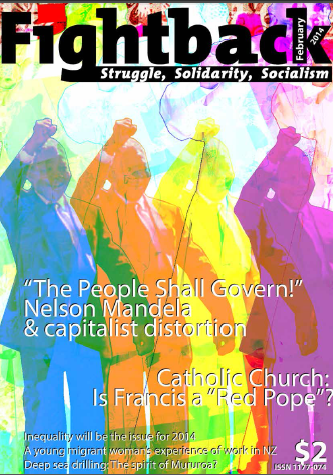 Welcome to the February 2014 issue of Fightback, monthly magazine of Fightback (Aotearoa/NZ). Established in February 2013, Fightback is now entering its second year. While the group may seem modest, we believe that a combination of community and working-class forces is necessary to overturning this system. With our publication, and with our wider work, we aim to play a critical role in these struggles. Mike Treen, Unite Union General Secretary, argued in a special feature on the Daily Blog (now Aotearoa/NZ’s most read left-wing blog) that “inequality will be the key issue for 2014” (reprinted p21-24). Treen argues, “there can be no lasting attack on inequality without also attacking its source,” an exploitative capitalist system. While also conducting education, debate and reflection, Fightback will continue to play an active role in class struggle over the next year. Over a protracted capitalist crisis, in the wake of global upsurges in Europe, North America and the Arab world, with even many capitalist thinkers reflecting on the failure of economic orthodoxy, and with a Pope emphasising the social justice aspects of Catholic doctrine, (p18-20) the ground may be shifting for revolutionary socialists and others who want to see an egalitarian world. Inequality is inseparable from struggles against oppression, and for liberation, generally; feminist struggles, queer struggles, the struggle for self-determination. Nelson Mandela, a leader and symbol of the struggle against apartheid, died late last year. Fightback covers his complex and contradictory legacy from p13-17. In Aotearoa/NZ, 2014 is an election year. Fightback has no illusions that we can simply vote socialism in, or that going into coalition with capitalist governments will provide a short-cut for socialists. However, by bringing wider community struggles to parliament, we aim to play an oppositional role that can point the way to a democratic socialist world. Fightback will be supporting the MANA Movement in the general elections. MANA has a proven leadership, both in community struggles and in democratically bringing the voice of the movement to parliament. We aim to take every opportunity in 2014 to advance the struggle for a new, just society. « Waitangi Day, Te Rā o Waitangi – What does it mean today, 174 years on?